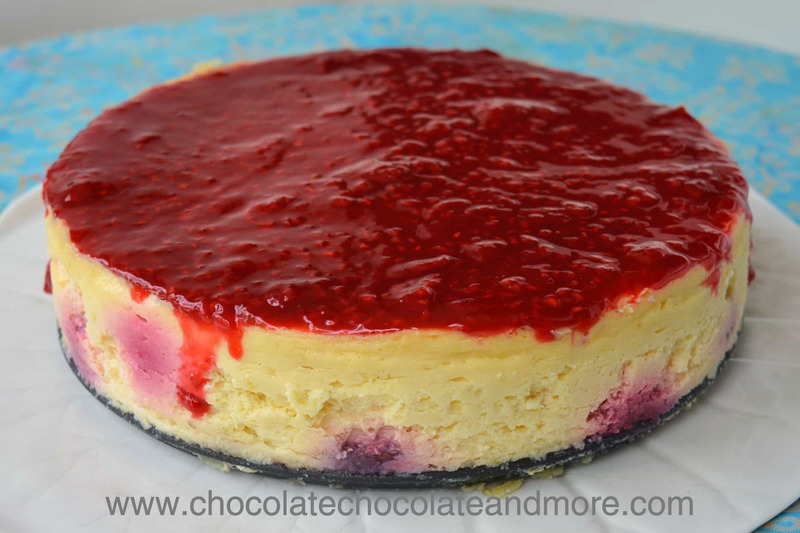 Raspberry Lemon Cheesecake - Chocolate Chocolate and More! 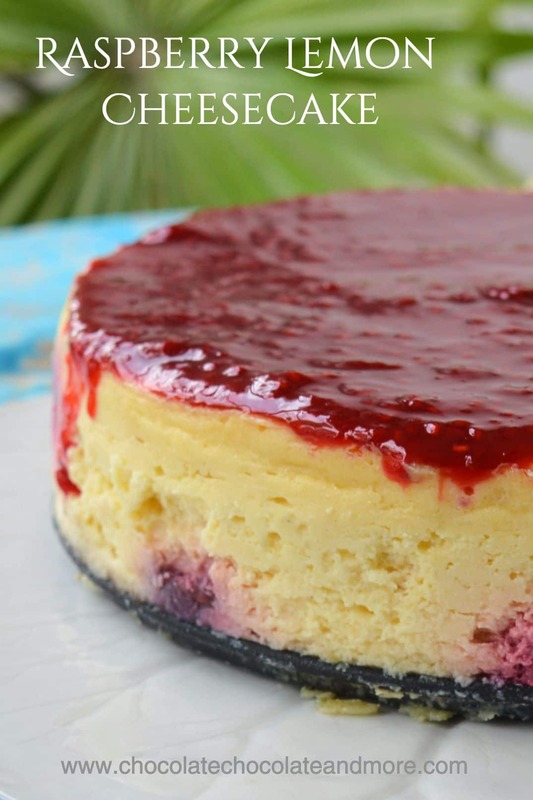 Enjoy a slice of raspberry lemon cheesecake and bask in the flavors of summer. Creamy cheesecake flavored with lemon curd, lemon zest, and raspberries topped with a raspberry lemon topping is bursting with flavor! My study abroad students are here so last week we spent touring the amazing temples of the Angkor archaeological park. Our busy schedule left no time to bake. I’m making up for it this week with this raspberry lemon cheesecake. I’m a sucker for raspberries. When I was a kid, my neighbors had raspberry bushes. The neighborhood kids used to sneak over and grab the berries fresh off the bush. It drove our poor neighbors crazy but those berries were irresistible. Back home I have raspberries nearly every day in my oatmeal at breakfast. Fresh berries are incredibly expensive here in Cambodia because they are all imported. A small container of raspberries usually runs about $10 (compared to $3 in the US). A few weeks ago, I bought a big bag of frozen raspberries at a reasonable price so I used frozen berries for this cheesecake. I also love lemon – especially in the summer. It reminds me of those lazy summer afternoons drinking lemonade with friends. I normally bake a 10-inch cheesecake so there’s lots to go around. At home, I use a large cast iron skillet for the water bath. My friends still have my large skillet so I used an 8-inch pan for the cheesecake and a 9-inch cake pan for the water bath. It was a tight squeeze but it worked. The water bath keeps the cheesecake really moist. There’s no sugar in the list of cheesecake ingredients. That’s not a mistake. I wanted the tart flavor of lemons to come through so the sugar in the cake comes from the lemon curd. The tart topping adds even more zingy flavor to this creamy cheesecake. And now for a confession. This cheesecake is so amazingly flavorful and creamy that my friends ate it all before I could save a slice to photograph. You’re going to love the summery flavors in this cheesecake! In a heavy duty mixer cream together the cream cheese and butter. Mix int the cornstarch, lemon curd and lemon zest. Blend until smooth. Fold in the raspberries and spread the batter evenly in the prepared pan. Before serving, top with raspberry lemon topping. Put all ingredients in a large saucepan and heat over medium high heat until the mixture begins to boil. Stir constantly while the mixture is heating. Heat for a few minutes longer until the mixture thickens and then remove from heat. Let cool before topping the cake. I made the topping right after I put the cake in the oven so it had plenty of time to cool before topping the cake. I love raspberries and of course cheesecake. My Gramma had a ton of raspberry bushes and we too always ate our oatmeal with fresh raspberries. I LOVE ALL OR AT LEAST MOST OF YOUR RECIPES. I WOULD LIKE TO KNOW HOW TO MAKE LEMON CURD. YOUR RECIPE CALLS FOR SOME. CAN I BUY IT AT THE STORE? BUT MY HUSBAND LOVES LEMON. I HAVE NEVER MADE A CHEESE CAKE. I DO NOT CARE FOR THEM MYSELF. I USE TO HAVE A SPRING FORM PAN BUT I THINK I GAVE IT AWAY. I DO LOVE A LOT OF YOUR RECIPES. THANK YOU AND HAVE A GREAT DAY. I never get replies in blogs such as this one however, I will give it a go. Cheesecake can be finicky when mixing. Would you mind providing times and speed for mixing? How long to mix first step and at what speed? I would love to try this as I make all my own fruit fillings. 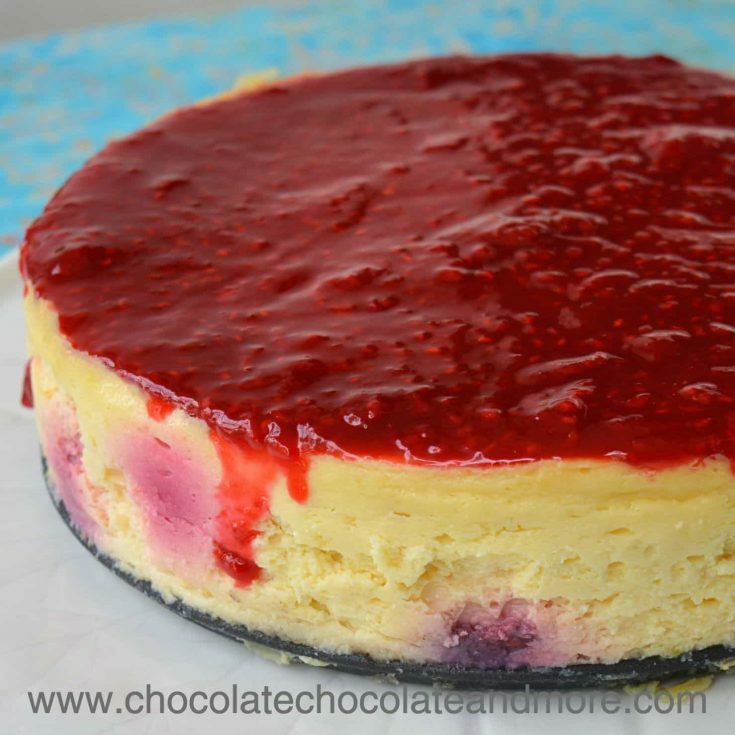 As well, I make cheesecakes but the ingredients and mixing methods are usually done differently. Hi Lori. Sorry for the delay in responding. I was in the hospital for a while so I’m behind. Speed and times for mixing will depend on your mixer. I have a pathetic mixer here in Cambodia so it’s very important that the cream cheese and butter be soft before mixing. I start on a low speed (or sometimes by hand to make sure i don’t over burden the mixer). Once the cream cheese and butter are mixed together and about the consistency of frosting, I start adding the liquids a little at a time and mix thoroughly after each one on medium speed. At home in the US I have a Kitchenaid stand mixer that is powerful enough to handle cream cheese and butter. With that mixer, I start on medium speed and pretty much mix everything on medium. Hope that helps.